The Lightning did not have time to lick their wounds after taking a 3-0 defeat at the hands of the Bruins. 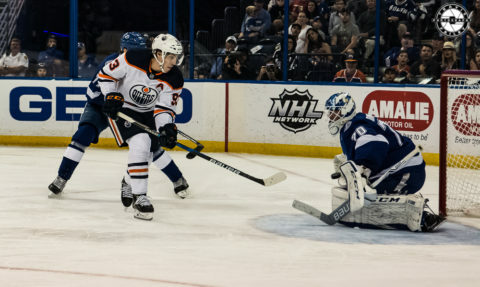 On Sunday afternoon they had a quick turnaround with at 5 o’clock start against Connor McDavid and the Edmonton Oilers. 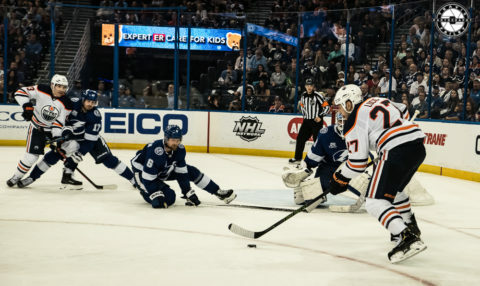 The Oilers came into Amalie Arena with little chance for a playoff spot but are on a high note after beating the Panthers 4-2 down in Sunrise. Connor McDavid had a goal and 3 points in the victory with the goal being his 34th of the year. 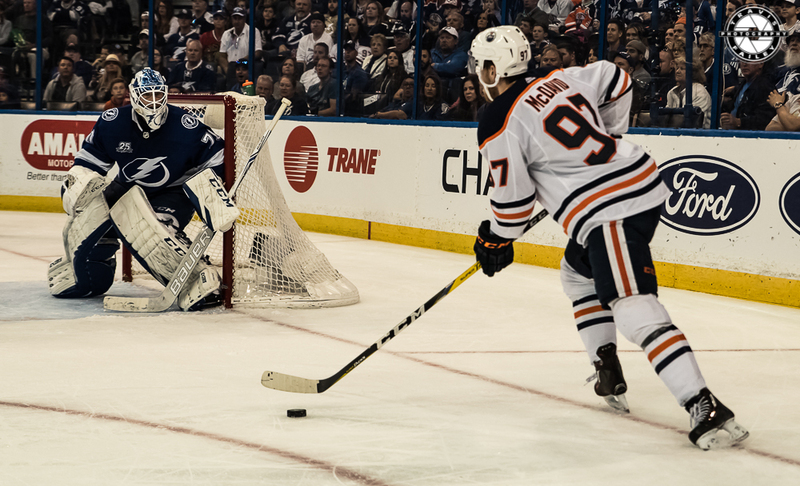 It’s obvious that one of the keys to stopping the Oilers is limiting McDavid’s output as the last time the Bolts faced the Oilers, the Oilers won on home ice by a score of 6-2 with McDavid tallying 4 goals. 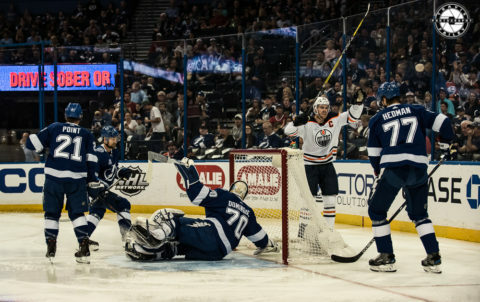 The Lightning got on the board at the 15:12 mark with a goal by Victor Hedman as he crushed a slapshot that deflected high right and clanked around the top off the goal post to make it a 1-1 game after 1. 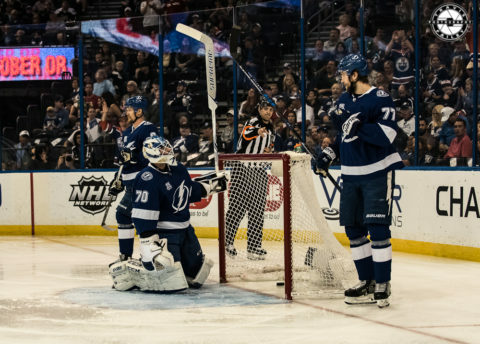 The Bolts struck again in the second period, this time on the power play as Nikita Kucherov went top shelf over an outstretched Al Montoya after taking the feed from Steven Stamkos. Kucherov wasn’t done though as he scored his second with 9 minutes left in the game to put the Lightning up 3-1. The insurance goal was big but not critical as the Lightning killed off a 5 on 3 late in the third period. The much maligned penalty kill was outstanding all night as they did not give up a power play goal in 5 tries for the Oilers. Key blocks were made all evening as the players sold out their bodies to help out on the pk. 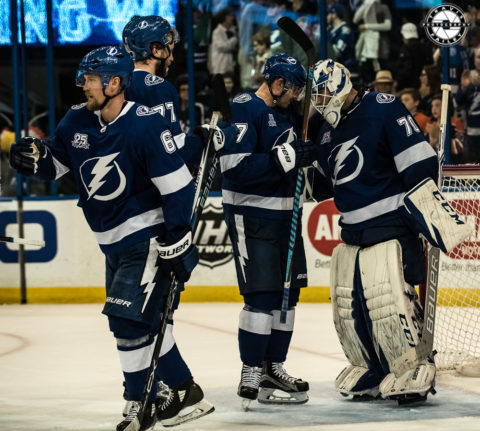 The first couple (of penalty kills), it was just outstanding work by the guys in front of the goaltender,” Cooper said.The Lightning blocked 11 shots during the game led by Ryan McDonagh with four. 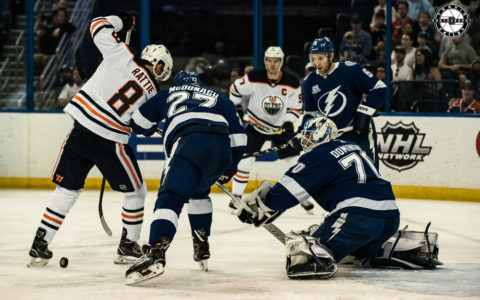 Another key in the victory was keeping McDavid off the board and Yanni Gourde and his linemates kept him in check throughout. Gourde took some questionable penalties but the penalty kill came through. 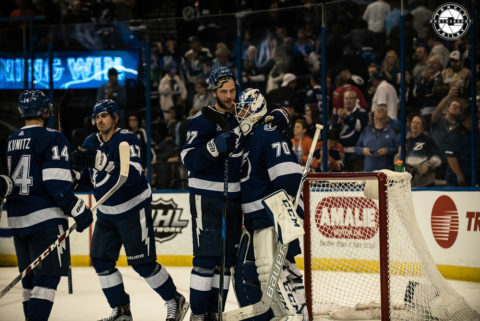 The Lightning now have a 4 point lead on Boston for the Atlantic with the Maple Leafs coming into the Oil Can on Tuesday night and with a late loss by New Jersey, the Lightning have clinched a playoff spot.